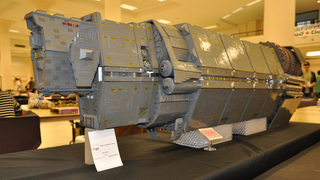 The Pillar of Autumn is perhaps one of Halo's most iconic ships - and the impressive cruiser cuts just as commanding an image when it's made out of Lego, as Lee Jones' gigantic model shows! The UNSC's blocky ship design is a perfect fit for Halo, as Jones' model shows - but it's the scope of it all that's most impressive. It took Jones three and a half years to build the replica of the ship from Halo: Combat Evolved, and seven thousand dollars worth of Lego pieces let him build his recreation up to 2.15 metres long. The whole thing weighs just over 100kg too. How much Lego does $7000 get you? A lot. Alas, the Autumn doesn't have much longer in this world - according to Jones, it was damaged in transit from a Lego convention in Seattle, and is going to be broken down for parts to go into a new Ship build. Poor Autumn. At least you got your moment of Lego glory before you left us. You can see a few more pictures of the ship over at MOCpages.